Try The World is a monthly food subscription box that sends you chef-selected local and authentic gourmet foods from different countries. Try The World offers their signature Pantry Box, a smaller Snack Box, and a Countries Box that features a new country each month. 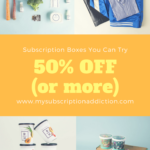 LIMITED TIME DEAL: While supplies last, when you sign up for a new subscription, your first shipment will include one free box! Your first box will be the Journey The World Box and you will receive the Chile Box for free! No coupon needed – just use this link! This month’s theme is Canada! The monthly fold-out booklet is so detailed with a map that shows you exactly where each product is coming from. There is a short ‘Welcome to Canada’ and ‘Meet the Chef’ section that goes into a bit more about this month’s location. You will also find a very detailed product section with a photo of each piece of food featured in your box. This was super helpful to use while navigating through each item. Finally, the back has a few recipes that you can create with some of the products you will find in your box. This booklet really sets the mood for the whole box and I loved it! I also received a coupon for my first HelloFresh box! Check out our Hello Fresh reviews for more information about this meal kit and to save $30 off your first box! This organic mustard is not the yellow mustard that you get at the grocery store. Instead, you get that rich color from one unique ingredient, turmeric! The overall flavors are very mild with not a ton of spice so this is a great mustard to introduce to kids. My son loves dips and really enjoy trying the unique flavors in each bite. As luck would have it, I was planning on cooking hot dogs this week so this will be the perfect topper! I love a little history and when the monthly booklet provides a unique look at this blend. At the turn of the 20th century, European immigrants arrived in Canada and developed this flavorful blend for meats and vegetables. Peppertree Spice now hand-crafts each blend and does a kitchen test to ensure the top quality and flavors. As you can see in the photo, there are so many spices packed into this bottle including coriander, garlic, chilies, paprika, among other spices. I grill a lot because it is a quick and easy way to a delicious dinner, and I am always looking for ways to add some bunch to what would normally be a basic piece of chicken. I used this as a dry rub to burgers and it was packed full of so many flavors! Ferme Vifranc Grade A Very Dark Organic Maple Syrup, 4.23 fl. oz. – Retail Value $3.00? I don’t think I have ever had fresh maple syrup like this before so I was very excited to try! This organic maple syrup comes from Ferme Vifranc Inc. which is a family owned business that makes certified organic maple products from Quebec. This very dark blend is rich in antioxidants and smells amazing! You really get an almost dark coffee, caramel, or toffee-like scent when you open the bottle. The syrup itself isn’t like the store bought stuff I am used to, much thinner that allows a little pour to go a long way! The flavor is so bold with just a light sweetness, nothing too overpowering. This salt is hand-harvested from the cold waters between the Shellfish Coast and Vancouver Island. The Vancouver Island Salt Company develops this all-natural salt that is infused with roasted garlic. Salt is one ingredient that I really shy away from when I cook but I know that I shouldn’t (my husband is always adding salt when I’m not looking). This roasted garlic salt was absolutely delicious and packed so much flavor in just a small taste that I knew this would be what got me excited to season with salt. They note that you can add this to vegetables, to season a burger, or even to add some flavor to soup. As luck would have it again, I am cooking soup this week and giving this garlic salt a test drive! Natural Skinny Foods Yogurt Covered Cranberries, 3 oz. – Retail Value $2.00? Fun fact from the monthly booklet, cranberries outrank nearly every other fruit and veggie in antioxidant capacity. I did not know that but am going to eat all of the cranberries now! I wasn’t able to find these to purchase online, but I wish I could because I loved them and need another bag! Yes, I had the whole bag already they were that good. Each little cranberry is covered in yogurt that could pass as white chocolate. Each bite is so rich and creamy they just melt in your mouth. The monthly booklet notes that Tease Tea was created by Sheena Brady to celebrate modern feminism by investing in the power of women. The company raises awareness each month and financial support for a local women’s group. I love when I can support products that then support others in their community! This tea, in particular, is a limited edition blend with ingredients of maple, safflower, and rose. When you open this bag you are hit with the most beautiful smell of sweet roses. If you can believe, I don’t have a tea infuser, but borrowed one from my Mom so that I could enjoy a warm cup of this delicious and flavorful tea! Cookie It Up Shortbread Chocolate Chip, 2 pieces, 1 oz. – Retail Value $3.00? These cookies are made in Aurora, Ontario using all-natural ingredients that they source from local suppliers. Cookie It Up makes each cookie flavor in small batches to ensure the highest quality and the most flavor. These shortbread cookies are a buttery delight and are both soft and crumble at each bite. The chocolate chips are so big that you get a ton of that bitter sweetness in each bite. Just one of these cookies isn’t enough so it was an added bonus that I received two this month! Verdict: This was my first experience with Try The World and I absolutely loved it! The quality of the box really shined through right from the start with the beautifully developed information fold-out. The products featured this month were all so unique and gave me a real taste for the fresh products produced in Canada. The curation and quality of each item were so wonderful that I could see Try The World making a wonderful gift for a fellow foodie like myself! Can I still get this box if I sign up today? All orders are shipped out within 30 days. If you place an order today you will receive the December box. 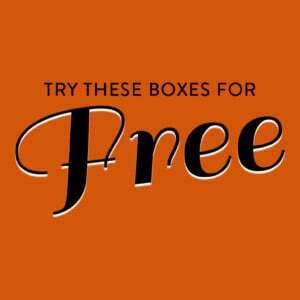 Coupon – While supplies last, when you sign up for a new subscription, your first shipment will include one free box! Your first box will be the Journey The World Box and you will receive the Chile Box for free! No coupon needed – just use this link! Value Breakdown: The monthly cost of this box is $39, including shipping. I received a total of eight products in this month’s box (counting the cookies as two items) which averages out to a value of $4.87 per item. While I loved the box, the overall value is a bit lower than the cost of the box. I would love to see maybe one or two higher price item to bring the total monthly value up slightly. What did you think of the Canada box from Try The World? One really shady thing this company does is post obviously fake reviews on various sites like TrustPilot. A Google image search shows that many of the profile pictures used for the fake reviews actually belong to other people (photos stolen from LinkedIn) or are stock photos. I’ve actually contacted some of the people whose photos were used for the fake reviews and they confirmed that the profiles and reviews are fakes. This company appears to be going out of business and has not been paying its suppliers (most of which are small family businesses that can’t afford to not get paid). Suppliers that have not been paid include the owner of Tease Tea from the Canada box, and she says it’s devastated her small business. Boxes arrive months late, if at all. They are no longer answering emails or their phone. Anyone who is even thinking of subscribing should read their FB comments to get a sense of what is really happening. They are no longer doing a single country per month, BTW. They likely burned so many bridges with their suppliers and at this point they are just getting rid of existing stock. Some customers received rancid products in their last “World” box (which is replacing their “Countries” box). Many more customers have received nothing at all, but TTW continues to charge them for their subscriptions. As a Canadian I have to say this box is awful. Apart from the cliched maple syrup where are the unique Canadian products? Mustard? please. Oh no, I’m so sorry to hear that. I thought they were great, but sad to hear that they aren’t more unique products to Canada. I’m so bummed that the beautiful blue box is missing! I know it’s silly, but the box is one of the things that keeps me subscribed. I’m also bummed that their shop is out of commission. I hope they bring the box back and get their shop running again in addition to fixing their shipping issues. I was surprised to not see that pretty blue box as well! Hopefully they will able to their shop and other aspects that you loved about this box soon! I have really enjoyed TTW in general, but I would caution that their shipping has been very delayed of late. Canada was actually their September destination (announced on their site 9/6). My August (Spain) and September (Canada) boxes both shipped during October, but I haven’t received any word on my October box or November yet. They said they were going through a warehouse/shipping change over the summer, but I had really been hoping they’d have straightened things out and caught up by now. FYI – I reached out to them on the shipping issue and they did at least respond very fast: “Thanks for reaching out and sorry for the trouble. We are still experiencing delays in getting all of our boxes caught up. Your October Box is currently scheduled to ship out within the next 1-2 weeks, and your November Box will ship in the beginning of December. I hope that helps clarify! Again, apologies for this long wait.” Hopefully they’ll be able to be fully caught up soon? I didn’t realize that, thanks for calling that out. Hopefully shipping will continue to improve. Thanks for your post! This company is going out of business and is trying to grab as much cash from unsuspecting new customers before they do. They have been shopping around remaining inventory at 10% of retail as part of the liquidation, but at the same time, they have also been trying to hook in new unsuspecting vendors. Many people in the industry have put out warnings about them to not give them goods without up front payment. They have seriously hurt many small family businesses by not paying them for their goods. On top of that, they are MONTHS behind with getting boxes to their customers, but they are still charging their accounts. The founders should be ashamed of themselves. I can totally see that now that you mention it! Inside, just beautiful products! Thank you for review, Taryn!